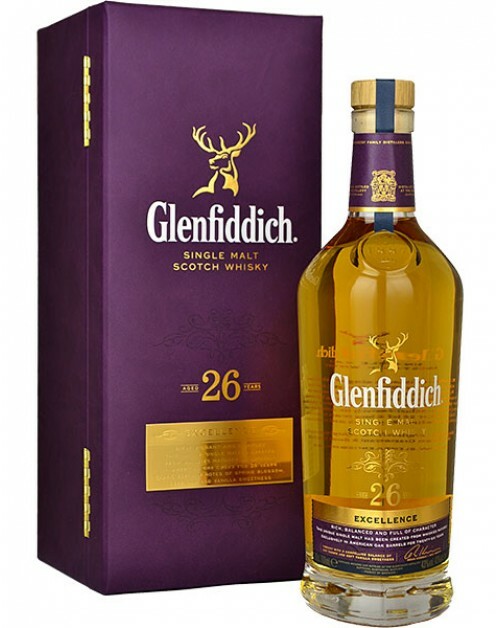 Glenfiddich 26 Year Old Single Malt Whisky is the first whisky of this age released by the Glenfiddich Distillery. Excellence 26 Year Old Single Malt is a very special release that was matured exclusively in American oak Bourbon casks and as such, it is the first expression in the Glenfiddich core range to be matured in this way. Nose: Delicate, but very fruity, floral and up lifting. Orange blossom, vanilla biscuits, soft mint and spices. A subtle leathery hint as well. Palate: Very gentle but not weak, quite creamy but definitely more spiced now before coming back to the fruity notes. Finish: Not too long. You can still get the fruits and pepper as they fade quickly.